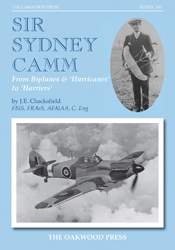 Sydney Camm’s greatest achievement was, undoubtedly, the creation of the Hawker ‘Hurricane’ fighter, although there are those who place this accolade on the ‘Hart’ biplane of 1929, which spawned a series of designs for the RAF in the 1930s and financed the expansion of the Sopwith empire. However, the ‘Hurricane’, during the Battle of Britain shot down more enemy planes than the combined scores of all other means, whether air-, sea- or land-based, is the aircraft generally associated with Camm. It helped to turn the tide on that crucial conflict in 1940 and enabled us to continue on the path to victory. Camm had a patron who realised his potential and used it to full advantage – this was T.O.M. Sopwith. Sopwith, of the same generation as Camm, was the complete opposite of him in background, Coming from a wealthy family, he could indulge in his passion for speed – motorbikes, cars, and racing yachts, before turning to aviation. Sopwith bought an aircraft and learnt to fly in 1910, and by 1913 he had begun to build his own designs. One of the acknowledged pioneers in British aviation, Sopwith recognised the design genius of Sydney Camm. With Camm’s design skills and Sopwith’s business acumen Sopwith’s company grew, and was by then renamed H.G. Hawker Engineering Company (later Hawker Siddeley). Sydney Camm went on from his wartime design success to enter the jet age with the ‘Sea Hawk’, followed by the classic ‘Hunter’ and was preparing to see the ‘Harrier’ into its production phase when he died in 1966. Camm was by all accounts sometimes a rather difficult person to work with. Sopwith is recording as saying: ‘He was a genius – but quite impossible’. A5, 128 pages, 96 illstrations.